The Shanghai Commercial & Savings Bank (SCSB) was first established in Shanghai in 1915, was re-registered in Taiwan in 1954 and resumed business in Taiwan in 1965 with the aspiration of “service to society, support for industry, and prosperity to enhance international trade”. It adopts a prudent approach towards developing its business and places strong emphasis on risk management. With corporate banking as its core business, SCSB also specializes in foreign exchange, cross-strait trade finance, as well as mortgage and wealth management services. SCSB enjoys sound asset quality and a robust financial and business structure, and has been a long-term leader among its peers in terms of business performance. In October 2007, SCSB was ranked the top bank in strength in Taiwan among other local banks by “The Asian Banker”. 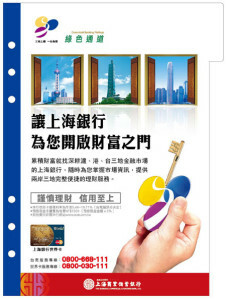 In 2011, SCSB was ranked the top bank among the commercial banks in Taiwan by the China Productivity Center in respect of both “Service Capitals” and “employee satisfaction”. Concurrently, SCSB won the prize of “2011 Taiwan Chapter’s Annual Risk Management Excellence” awarded by Global Association of Risk Professionals (GARP) Taiwan Chapter. In March 2013, “Global Banking & Finance Review” named SCSB as the “Best Commercial Bank in Taiwan 2013.” In April of the same year, “The Asian Banker” again recognized SCSB as the “Best Managed Bank in Taiwan.” In July, based on the ranking conducted by “The Banker”, a U.K.-based financial periodical, SCSB was ranked the 224th largest bank in the world in term of tier one capital.